This is a Dutch Baby pancake, or sometimes called a German pancake. The pancake is oven-baked in a skillet until it puffs-up and turns golden brown in color. 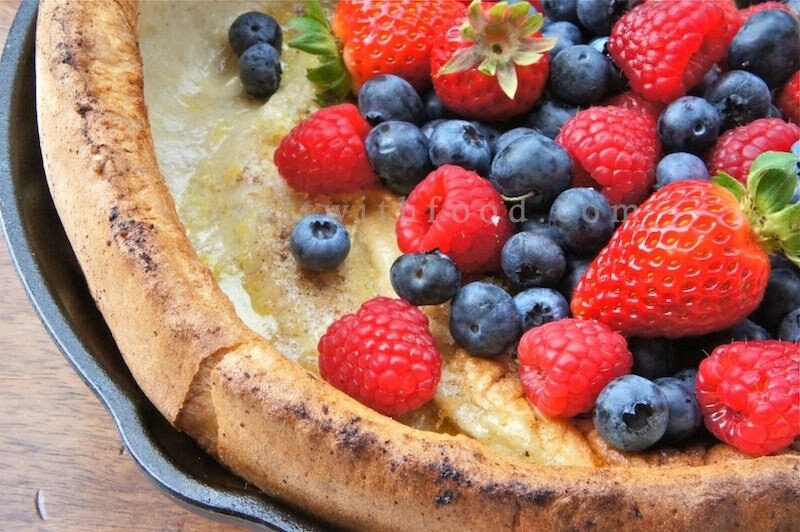 Serve this Dutch Baby straight from the oven with some lemon sugar and some fresh berries. It’s like a sweet breakfast version of Yorkshire pudding. Simply delicious! Put the skillet on middle rack of the oven and preheat oven to 450˚F or 225˚C. In a small bowl, rub the lemon zest with sugar. Beat the eggs with an electric mixer at high speed until pale and frothy then beat in milk, flour, vanilla, cinnamon, nutmeg, and sea salt until smooth, about 1 minute. Remove the skillet from oven and melt the butter. Tilt the pan so that the butter coats the sides and pour in the batter. Return the skillet to the oven and bake until puffed and golden brown, 18 to 25 minutes. Serve immediately, topped with lemon sugar and fresh berries, if desired. I am making this today. Thanks. 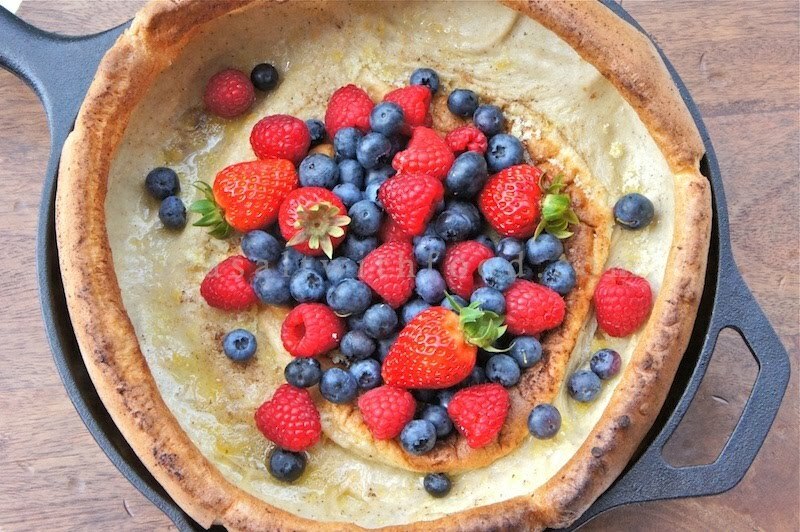 I recently became fascinated by skillet bakes... this skillet pancake looks so rustic and wholesome! I've seen so many recipes lately for lemon desserts! So far, I think yours must be the best! The other one I really like is Ina Garten's Lemon Yogurt Cake. What do you think? Thanks again for sharing this delicious lemon recipe! @Sophia: Thanks.Ina Garten's Lemon Yogurt Cake sounds good to me. Thanks for the link.